As the nighttime temperatures came up in January, so did the production of the garden. I am happy to report that the snow peas are ramping up production with the cool sunny days. Most exciting this month is the first heirloom tomatoes spotted on a volunteer potted plant that popped up in the fall and I have kept protected through the cold nights. The cayenne and serrano pepper plants continue to steadily produce ripe red peppers and a few red bell peppers have been harvested. The many other tomato plants are flowering and expect signs of fruit soon. I harvested all the cauliflower and have planted a second batch. I will harvest all the carrots planted in fall in the next couple weeks and have started a new planting in the demonstration garden. I planted the spinach too late last year, so this year with an earlier planting, I have multiple plants doing very well. My 2 bok choy plants provided lots of bok choy for a couple months, but finally had a final harvest in mid-January when it began to flower. I have replanted with seedlings and should have mature plants by March. The tidy tips, nasturtiums and marigolds are in full bloom. The borage is getting ready to bloom. I began transplanting some of the seedlings that I started indoors in December. I planted the basil, parsley, dill, bok choy and cabbage into the garden. The basil seedlings are covered to protect them from the colder nights. I will plant the zucchini, melon, pumpkin, pepper, tomato and eggplant seedlings in February when frost risk has passed. 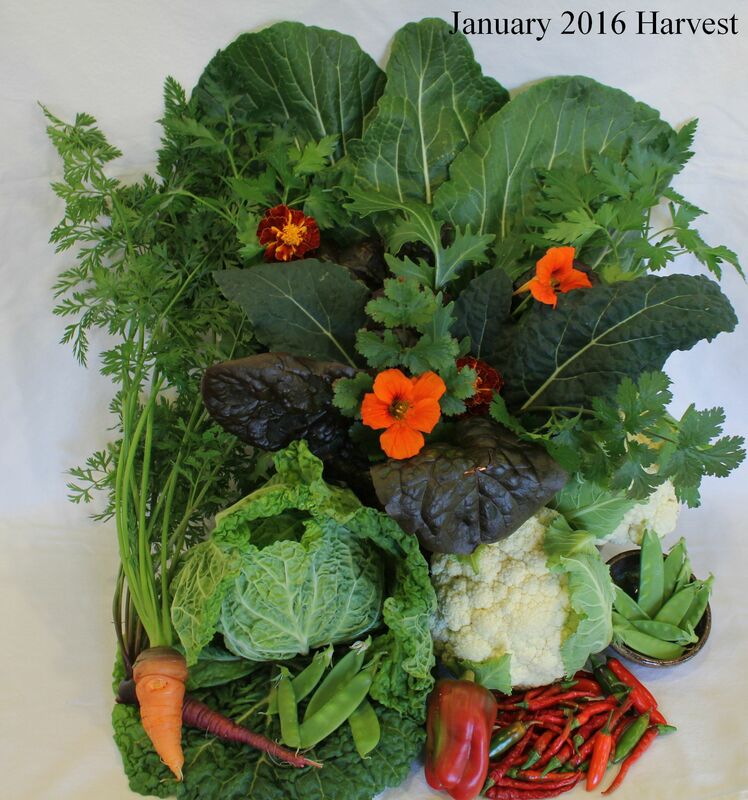 January Harvest picture - Bok Choy, Lacinato Kale, Rouge Romaine, Mizuna, Carrots, Cauliflower, Savoy Cabbage, Snow Peas, Bell Pepper, Cayenne & Serrano peppers, Nasturtium & Marigold flowers, Cilantro, and Parsley. I would recommend visiting Singh Farm as an example of building a permaculture garden environment. They are open to the public on Saturday from 9am - 1pm. All the snow peas are doing great and ramping up production. The first planting of Cauliflower (8 plants), where harvested through the month of January. All the endive plants continue to do well and expect to be harvesting these in another month. The carrots did not disappoint, they are super sweet. The basil died back from the cold temperatures. Even with protection, some of the pepper plants sustained frost damage. All of the bok choy had to be harvested in mid January as it began to flower. It is time to plant your tomato transplants once the soil temperature is 50 degrees, so about now! Grow the short season varieties, those that will provide tomatoes within 60 - 70 days. Three things are needed to grow tomatoes, a lot of compost mixed with soft phosphate, Texas greensand, and 20%volcanite mixed into the planting area, + a fish emulsion/liquid seaweed fertilizer. Remember that tomatoes and peppers like the soil to remain moist, so a good layer of mulch can help. As we will still have cold nights for another month, be sure to protect your plants by covering them to retain heat and keep any frost from touching the plant. February is the month to fertilize your citrus trees, grape vines, and deciduous trees. Top dress your existing plants & trees with 2 - 4 inches of compost (make sure it does not contact the trunks). Fish emulsion and liquid seaweed as a foliar spray or during watering can also be applied. We include chicken manure with our compost for the citrus trees. We also include coffee grounds in our compost which is rich with nitrogen and can be collected for free from Starbucks. 1. Fertilize citrus, roses, lawns, grapes and deciduous trees. 2. Remove dead, diseased and cross limbs from your shade and ornamental trees. 3. Once danger of frost is over, trim any winter damaged foliage. 4. Prune back grapes 80 - 90%, peaches and plums 40 - 50% to encourage new 45 degree growth. 5. Compost and mulch any unhealthy soil areas. 1. When pruning don't ever remove more than 1/4 of the total plant. Always use sharp, sterile, quality pruning tools and disinfect them between cuts to prevent the spread of disease. 2. Don't cheat on soil preparation for flowers and vegetables. 3. Don't fertilize dormant Bermuda grass until late April or May. 4. Too much fertilizer can cause salt burn and too little can cause nutrient deficiency problems. Water both the day before and immediately after applying granular fertilizers. 5. Don't fertilize mature trees near the trunk. Fertilize the outer two thirds of the ground of the leaf canopy where the most active roots are. 6. Don't water grass at night when the temperatures are coolest as this fosters the growth of fungal diseases. 7. Don't mow when grass is wet. This also may result in fungal disease. 8. Don't delay on weed control. Handle weeds while they are young, tender, and their roots are manageable, or before they sprout. • Seeds - Beets, Bok choy, Broccoli, Carrots, Chard, Collards, Corn, Cucumbers, Lettuce, Mustard, Green Onions, Peas, Potato, Radish, Spinach, Summer Squash, Turnips. Remember to plant early-maturing varieties and protect your seeds from cold weather and birds for best results! • Herbs: Anise, Basil, Bay, Caraway, Calendula, Catnip, Chamomile, Cilantro, Chives, Dill, Epazote, Fennel, Feverfew, French Tarragon, Lavender, Lemon Balm, Lemon grass, Marjoram, Mint, Oregano, Parsley, Rue, Safflower, Sage, Savory, Thyme. • Flowers: Alyssum, Begonias, Chrysanthemum, Coreopsis, Dianthus, Gallardia, Hibiscus, Marigold, Nasturtium, Petunia, Poppy, Snap Dragon, Society Garlic, Sunflower, Sweet Pea. • Fruit: Watermelon & Cantaloupe in mid-February. 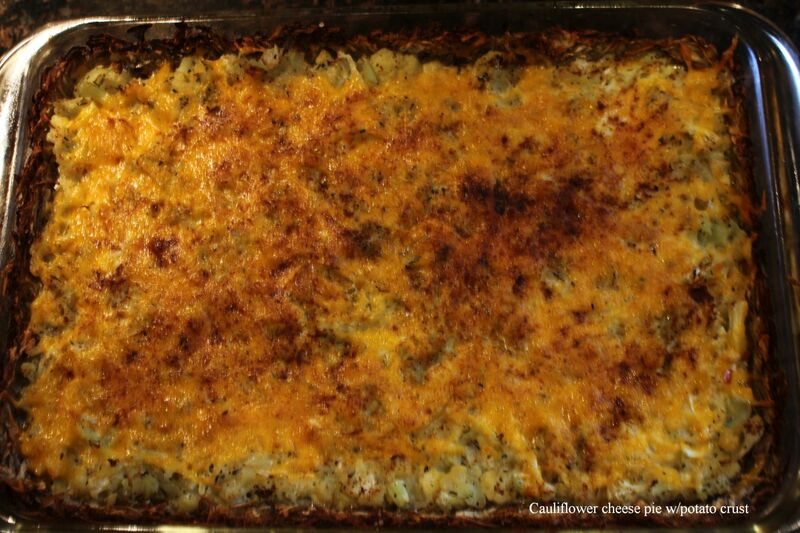 - Cauliflower Cheese Pie with Potato Crust - This is a seasonal recipe as cauliflower is now in abundance. Two different readers (Sara and Joe) sent in issues regarding citrus issues. Q: Why were my pomegranates hard or rotten ?